Whether flat or rolling or 27% - there are roads in Lake Como for everything! There are dozens of ComoLagoBike guided road cycling routes that range from easy, medium, hard, to epic. Join the guides for a different route each day, or do a customized itinerary of your choosing. With the Bottecchia carbon fiber road bikes and their low gear ratio (typically 34x32), any climb will be doable. The narrow lakeside roads of Lake Como can be busy with traffic, but once you turn into the hills everything becomes quiet. A few of the classic ComoLagoBike routes are described below. If there is one ride you do on Lake Como, make it this classic. This short but sweet tour takes you on the pilgrimage to the Madonna del Ghisallo chapel and museum as well as to some of the best sites in the region. It is also a great loop to welcome your legs to Italy after being cooped up on a plane or in a car. Start with an easy flat ride from Bellagio to Onno, then a gradual climb up to Valbrona and its Ad Onore Del Ciclista fountain, in honor of local hero Fabio Casartelli. From Valbrona it's a beautiful ride west through the valley to Asso, where you turn back north and start the gradual climb to Magreglio and the Ghisallo chapel. After a visit, it's descending switchback after switchback to the front door of Il Perlo! Click on image to explore the route. Ready to climb like a pro? This ride features two steep climbs often featured in the Giro di Lombardia. The Salita Madonna del Ghisallo, which starts down the road from Il Perlo, is done every year, but instead of having a few hours under your belt like the pros, you'll start the climb out of the gate. Put it in a low gear and slowly warm up the switchbacks and rollers to the Ghisallo chapel, then ride towards Sormano and start the long climb to the Colma di Sormano. After the village of Sormano you have the choice of tackling the brutal Muro di Sormano (only 1.7 km with an average 17% grade, maximum 27%!) or the more gradual main road, both which lead to the Colma di Sormano, its restaurant, and views of the Triangolo Lariano. Then the best part! The long, fast technical descent to Nesso - also often included in the Giro di Lombardia. Finally, the lakeside road back to Bellagio and one last climb to Il Perlo. Who doesn't want to invade Switzerland by bike? There are two routes to Lake Lugano. The longer route crosses the Swiss border to the far side of Lake Lugano and the ritzy town of Lugano, while the shorter route heads straight to the north end of Lake Lugano and back to the Lake Como ferry. Both offer you a ferry ride to the west side of the lake, then a beautiful gradual climb through the Valle d’Intelvi past churches and small villages. A ferry ride to the picturesque village of Varenna on the east side of Lake Como begins this beautiful, classic route without any long hard climbs. 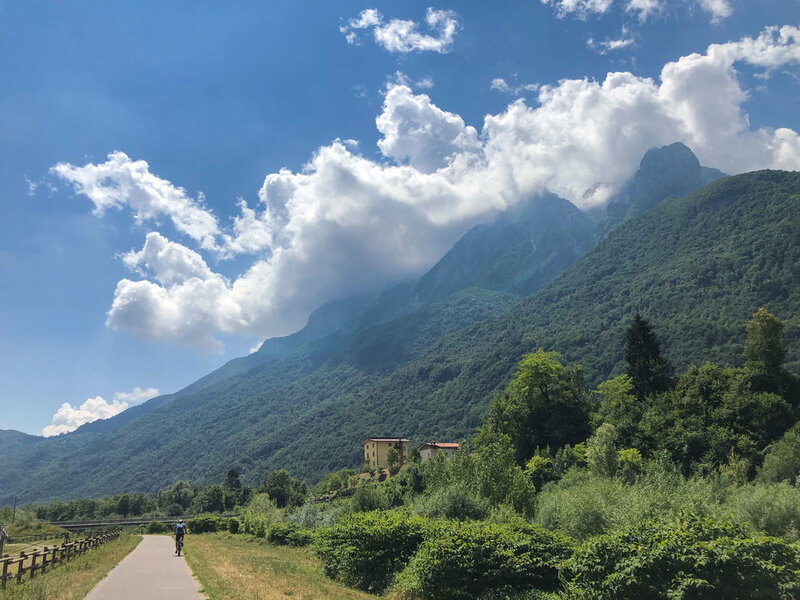 A short gradual 5 km climb out of the Lake Como basin drops you into the Valsassina, the valley nestled between Lake Como's Grigne mountains and the pre-Alps to the northeast. Look up and you'll see craggy peaks dotted with snow fields and huge green mountains dissected with ski lifts, but you're down in the valley gradually climbing your way to the south end of the Grigne massif and the most spectacular descent into Lecco. Steep granite cliffs and perhaps some paragliders greet you back at the lake, where you can stop at a caffè before finishing the ride back to Bellagio. Bellissimo!